Pro wrestler-turned-musician-turned-actor John Cena is now in charge of a reality show, too. The face of the WWE for the past decade, Cena is now working on a reality competition program for Fox, “American Grit,” in the shadow of Mount Rainier, south of Seattle. Roughly 90 minutes south of Seattle, in the woods in the shadow of Mount Rainier, 16 men and women are competing for a $1 million prize with the coaching of four military mentors — and the aid of a 15-time wrestling world champion. And his name is … John Cena (cue his wrestling theme, “The Time is Now”). 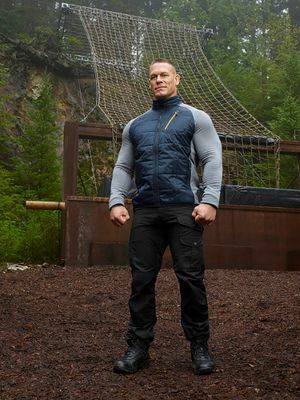 The face of the WWE for the past decade, Cena is at the helm of the Fox competition series “American Grit,” due to air in 2016 and currently shooting in Pack Forest, about 30 miles south of Puyallup. Like Dwayne “The Rock” Johnson before him, Cena has done about all he can to attract fans to professional wrestling. “But I still want to put people in the building,” he said, and in order to do so he’s spreading his brand to reach new audiences. He’s recorded rap and hip-hop; he’s appeared on TV; and he’s been cast in films, like this year’s “Trainwreck,” starring Amy Schumer, and the December release “Sisters,” starring Tina Fey and Amy Poehler. In the highly illogical world of online fame, Cena has inspired memes and a prank-call recording that has been heard by more than 20 million people. More recently the Cena phenomenon has spilled onto college campuses in the form of “College Gameday” signs, with fans waving Cena-inspired memes and variations of his popular mottos behind the announcers on ESPN’s popular college football broadcast. “You never take it personal,” he said, adding that he loves seeing what people come up with. It’s all a part of what he is trying to do — and that is entertain. “I can either roll with the punches and keep the tidal wave going or I can pitch a fit, and that’s pretty much where it stops,” he said. Being a part of “American Grit” should come as no surprise to those familiar with Cena’s career, where he has long been associated with the military, be it with his film “The Marine,” or entertaining troops at home and abroad. In scouting for locations, executive producer Brent Montgomery said that Fox looked at several locations, with Washington being a clear winner. “You can’t go wrong up here; you get a lot of different looks,” he said of the topography. Filming is in the early stages, but already the show has seen days filled with sun, snow, rain and of course, gray. The location also was nicely tucked away from the spotlight of those wondering what Cena had been doing while away from the ring. “Certainly not a lot of media stir outside Puyallup,” Cena said. Unlike most competition shows that thrive on friction in and among the teams, “American Grit” aims for a military-inspired camaraderie among the competitors with an emphasis on teamwork and motivation, not backstabbing. • Purple Heart recipient (and “Dancing With the Stars” third-place contestant) Noah Galloway, an Army soldier who lost his left arm and leg in combat and has since started his own fitness and health charity. • Marine Gunnery Sgt. Tawanda ‘Tee’ Hanible, who founded an organization connecting veterans as mentors for at-risk youth. The contestants, housed in barracks-inspired housing complete with a kitchen, fitness setup and a hot tub with a killer view of the mountain, represent a wide range of backgrounds and disciplines. They’re competing for the $1 million, which, in theory, could be won by a complete team of four or by an individual. Being around competitors with a history of success as well as four celebrated military veterans gives the 6-foot-1-inch, 250-pound WWE champion a sensation he rarely experiences. “I’ve never felt so inferior in my life,” he said.